When I bought the 350 four,15 or more years ago, the original engine had the sump missing, one of the plugs was seized into the head and one piston was seized into its bore, not really a disaster, but would need work and time spent on it. I was fortunate that amongst the huge cache of spares I bought a little later from an advert in Tansha, there was a very good engine - admittedly partly dismantled, but that seemed a far better bet to get the bike up and running, registered and on the road. The original engine was put to one side as I really wanted to use it eventually, mainly because the number was correct for the year. I stripped it a while later to a bare pair of crankcases and boxed all of the other parts - all in excellent condition which seemed to indicate that the 10,000 miles recorded on the original smashed speedo might be correct. Some time ago I thoroughly cleaned and painted the cases and again put them to one side for rebuild. The spare engine, after reassembly has been absolutely wonderful in service - no nasty noises, never uses a drop of oil and pulls very well for a 350 so I suppose I could have just simply swapped all of the guts of this engine into the correctly numbered cases, but I decided to rebuild the whole of the original one in the end. Even doing everything myself, there is the inevitable cost of gaskets, seals, cam chain and tensioner guide and blade, which as I write this in 2014 easily tops £200. These bikes are starting to be worth acceptable money, so I was happy to pay this amount to get the original engine back in. These are the cases painted in Hammerite 'Smoothrite' spray ready for reassembly. I used this same paint on the engine which is still in the bikeand after more than 10 years, still looks as good as when I first painted it. The rebuild is quite straightforward and covered in many manuals, but cleanliness is absolutely ESSENTIAL - these are precision built units and should always be treated as such. Make sure that all oil passages are scrupulously clean and all threads cleaned out and checked and that all dowels are present and not distorted. This is the simple rig I use to reassemble the engine, made from scraps of moisture resistant MDF and a length of rod to pass through the upper rear engine mount hole. These are the first parts to be fitted to the upper case - primary chain guide, with 'pip' facing the gearbox, selector drum and forks plus bearing, idler gear which meshes eventually with starter motor pinion. Don't forget a new lock washer under the head of the M6 bolt and to bend it up on one of the bolt flats and down onto the casing. 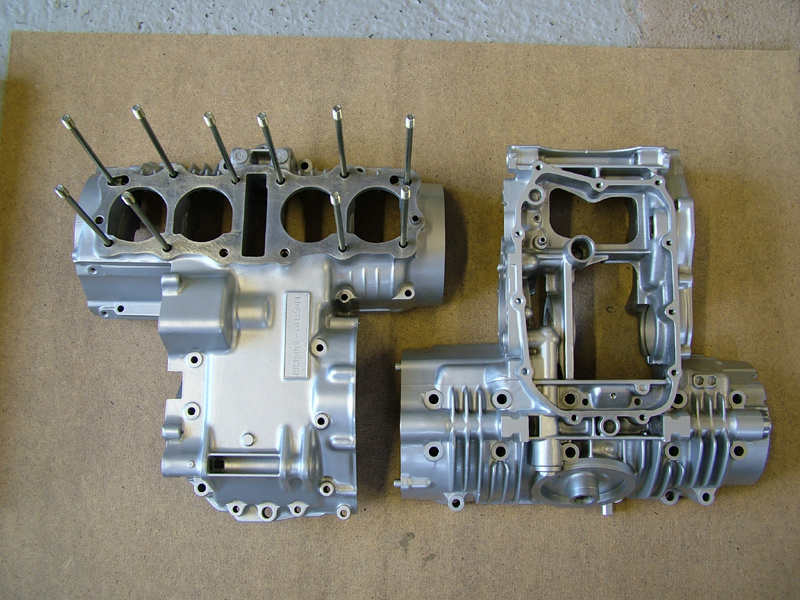 The upper main bearing shells have also been cleaned and fitted at this stage, lubricated with Moly 60 paste. 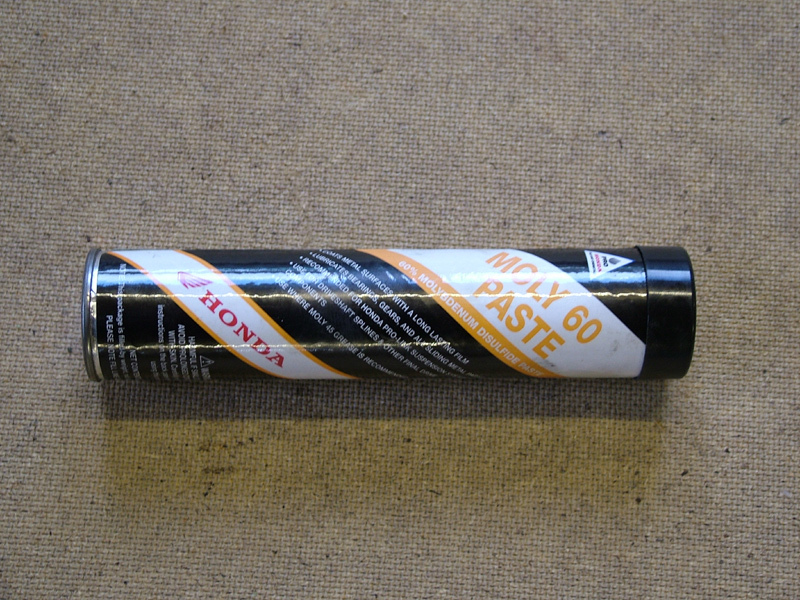 I use this Honda Moly 60 paste for the drive shaft splines on my GL1500 Gold Wing and it is ideal for bearing shells during build up, especially if it might be some time before completion and start up - until the oil gets around everywhere. 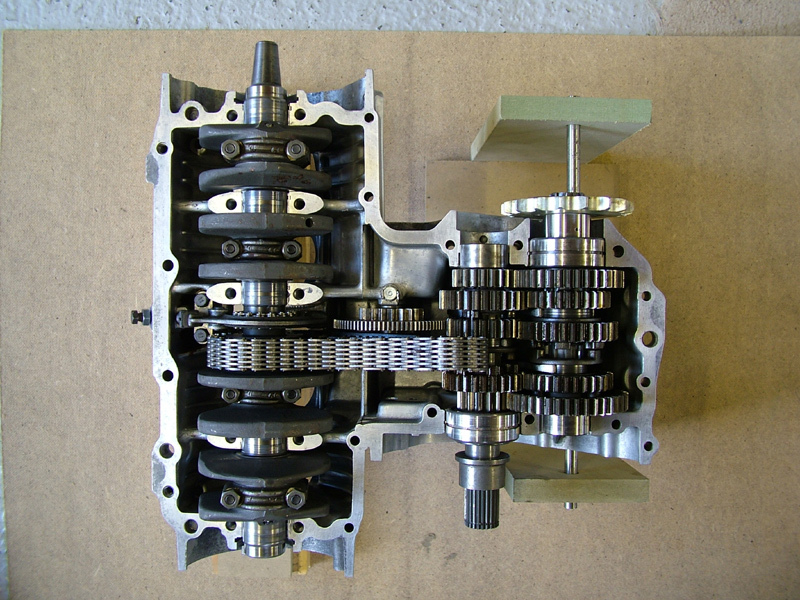 Gears and shafts are now assembled and the bearing locator half rings and pegs are shown - the pegs prevent the needle roller bearings from rotating and the half rings locate the ball bearings laterally. The final drive sprocket was 'as new' so I cleaned and re-plated that along with all of the crankcase bolts and clips. Gears and shafts trial fitted, now the seals can be fitted by slightly lifting the shafts one at a time. The crank is now lowered into place and the primary chain is just resting on the slipper guide. All of the big end shells have been similarly treated with Moly 60 and torqued up prior to fitting the crank. 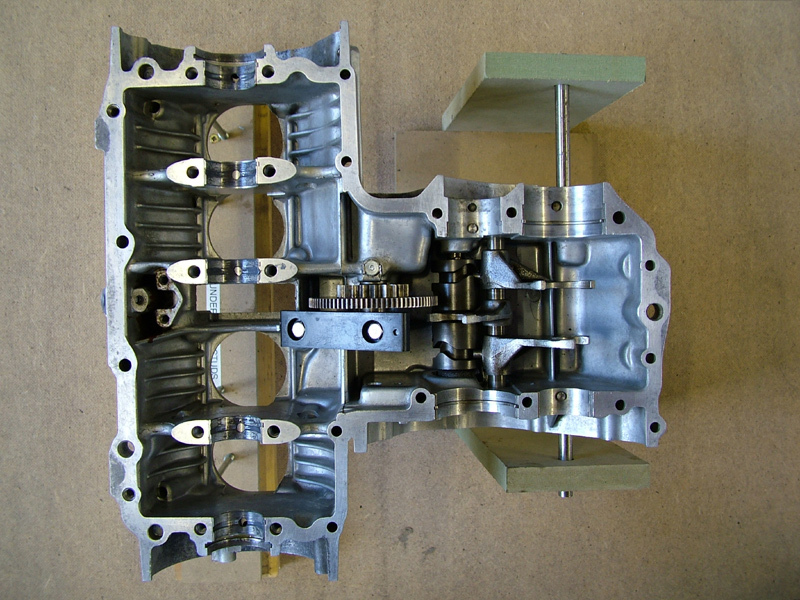 The tangs on the big end shells and therefore, the indents in the rods face towards the front of the engine and must be fitted to their respective crank pins. The eagle-eyed might see that the 'top hat' spacer shown slipped temporarily on the clutch shaft, really belongs on the cush drive/starter pinion shaft which lives in the lower casing; I had just cleaned it and didn't want to set it down anywhere to misplace it. 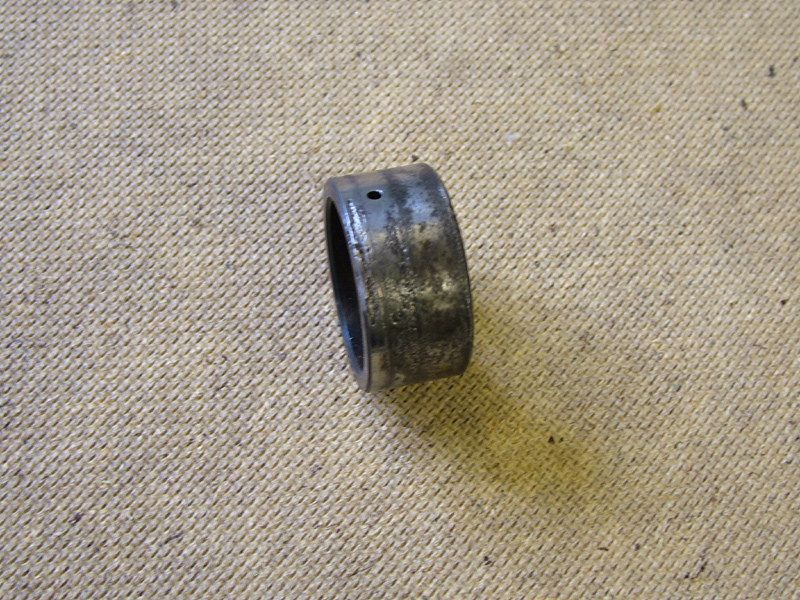 This is the sleeve on the output shaft of the gearbox which the final drive oil seal runs on - the surface is rough and was rusty when I first stripped the engine. 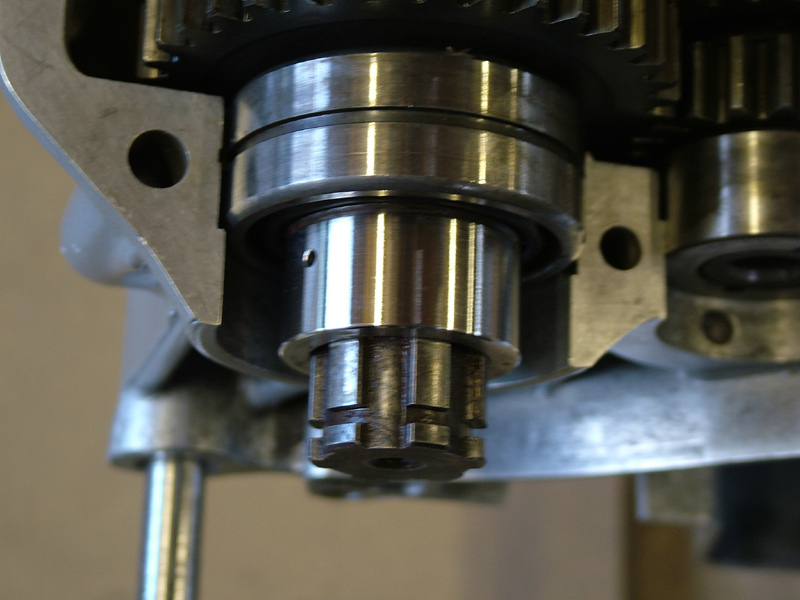 Unfortunately it is not available separately, but only as part the gear/shaft/bearing assembly. Rather than try to source another, I set to and made a new sleeve on the lathe from stainless steel. 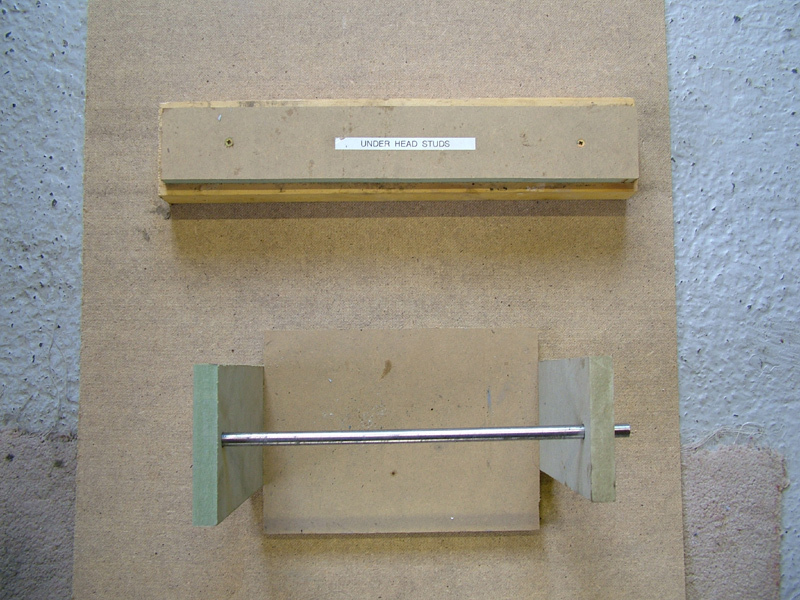 It's quite a precision piece and is a press fit on the shaft and has two oil holes drilled at a slight angle. This is the sleeve fitted and ready for the seal to be fitted. 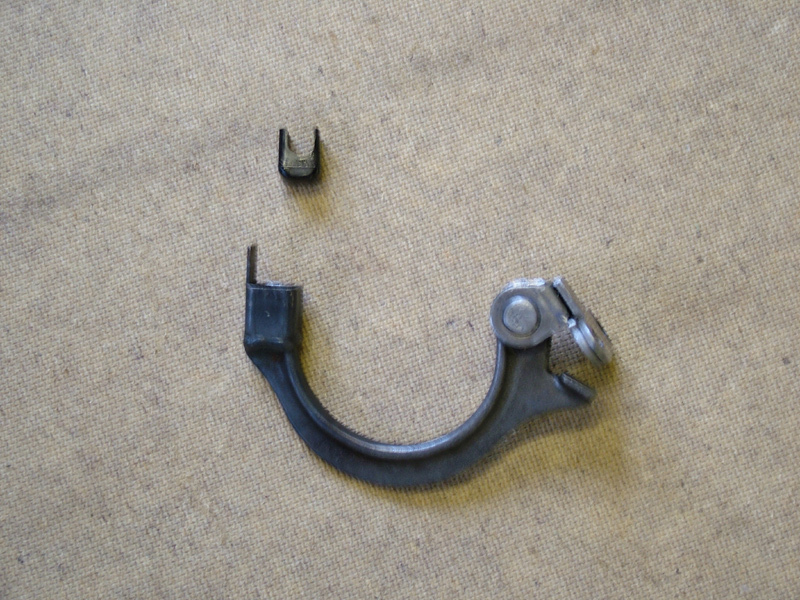 This is the original cam chain tensioner and buffer - it was locked up as they usually are because the chain had been allowed to flap against it. I removed the pivot pin, dressed out the damage then made and riveted in a new pin, so it's as good as new now. 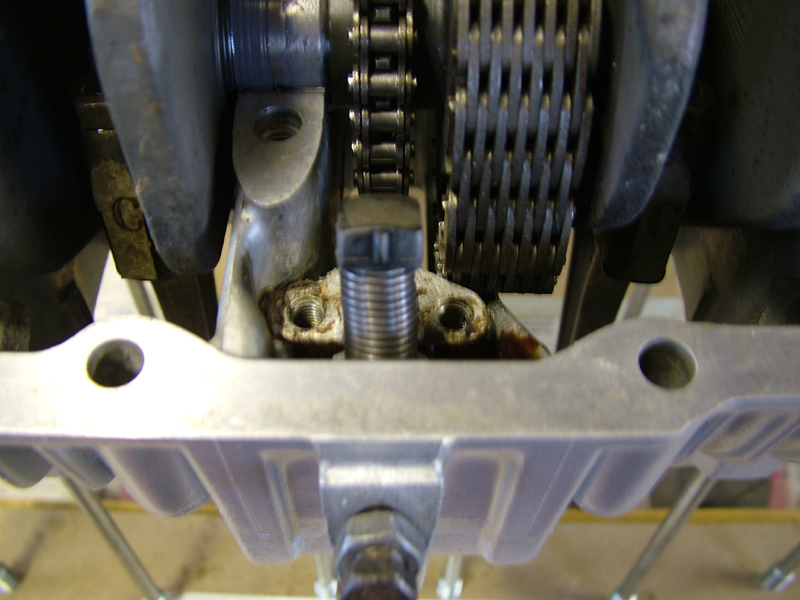 This shows the tensioner spring and pad, fully compressed (until the top end is assembled), the tensioner arm can now be fitted with the 2 special bolts loctited in - don't forget the little buffer block, which I hold in place with a dab of grease until the tensioner blade is fitted from the top. The end of the 'pusher' away from the spring has an internal thread (M3) and I usually screw a bolt in with a washer on the top, which stops the pusher from pushing the arm until you get the rest assembled. I usually trial fit the other (lower) crankcase half after fitting the cush drive/starter roller pinion into the primary chain. Now I lift off the casing again and apply a thin coat of Blue Hylomar to the joint face with a small paint brush, taking care not to block any oil ways or put any onto the main bearing shells; I normally just nip the casing bolts a bit more than finger tight and leave for an hour or so, before torqueing everything tight, which allows the gasket compound to set slightly and form a uniform seal. Once all of the lower bolts have been fitted, then the whole assembly can be rotated on the steel rod so that it is now the right way up. You will need a wooden packing bock under the sump gasket face to get everything level. The rest of the crankcase bolts can now be fitted and torqued, not forgetting the 2 wiring harness clips under 2 of them. From here it's a matter of choice, but I prefer to fit the engine back into the frame at this stage while it is relatively light in weight; if you keep on reassembling things like the generator parts, gear change mechanism and the clutch it starts to get quite heavy for one person. One VERY important note concerns the two lower front bolts which hold the front of the engine - they are of different lengths and if you use the long one in the left side, then all will be fine. If, however, you use the long one on the right, there is a real danger that the end of the bolt will puncture one of the main oil galleries, CHECK first - you have been warned!